Most of us receive numerous blessings, but we don’t stop very often to appreciate — or even notice — them. Part of being a happy person includes recognizing the good things that happen every day and being grateful for them. Some people keep gratitude journals, but I’ve always found that overwhelming. Seems like you need to write the “biggies” of life there: family, friends, health, meaningful work, food, shelter, etc. And after you’ve run through that list (quickly), what else do you add? I feel like the benchmark for daily entries is too high. Instead, I routinely list “3 Good Things” that happen to me that day in a notebook every night before going to sleep, which ends the day on a positive note. It takes two or three minutes. However, I really like the idea of a new Happiness Jar Experiment, attributed to Elizabeth Gilbert (author of Eat, Pray, Love). It cuts to the chase in helping you appreciate the things that enhance your life — and takes less than a minute a day. The pressure is off — no journal, no lofty list, no fuss. You simply grab a scrap of paper (back of an envelope, junk mail, Post-it note, etc.) and jot down the nicest thing that happened that day, then insert it in the jar. …in short, anything that lifted you up. At the end of the year (or any time you’re having a “nobody-loves-me” day), pour out the papers and review the things that gave you pleasure. You can decorate your happiness jar (do a search for “happiness jars” on Pinterest), and make jars as gifts for friends — especially those who are going through a tough time. Who knows? It might be just what they need to help them see the joys behind the tears. 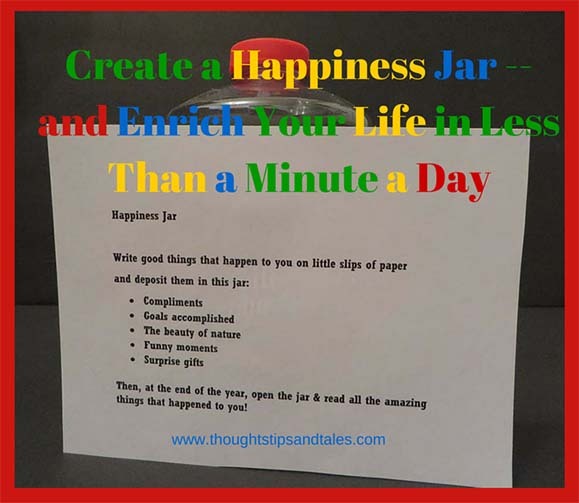 And happiness jars can also be family projects: have every family member create one and set aside a time every day (maybe after dinner) when everyone can discuss their favorite part of the day and deposit a slip of paper in their jar. Taking a few moments every day to recall the best part of it can’t help but enrich your life. This entry was posted in family activity, gratitude, happiness jar, happy moments and tagged family activity, gratitude, happiness, happiness jar, how to be happy. Bookmark the permalink. Darling idea- seems entirely do-able!